I accidentally removed DIN Time from the app store for about 30 minutes today. It should be back in the app store and on your watches again now. I’m really sorry for the trouble! I had to release version 2.43 of DIN Time today. In the second to last version a bug was introduced that caused custom color weather icons to always be white. That has been fixed now. 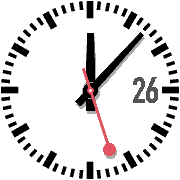 Today I released a simple watch face, MonDIN, created for my personal use/experimenting when I first got the Pebble Time Round. It has seconds, date (in DIN Engschrift!) and Bluetooth disconnection warning with vibration and visual alert. And a discrete shadow under the hands, just to give it a little depth. In this initial release there are no settings at all. What you see is what you get. I do however have plans on adding some options, like turning off seconds and perhaps changing some of the colors.